Family run vineyard & agriturismo, Baglio Vecchio offers peace, tranquility and rustic old world charm in the wilds of North West Sicily. The property is an 18th century baglio, a traditional Sicilian farmhouse, which has been respectively restored and retains the atmosphere of a bygone era without sacrificing modern comforts. 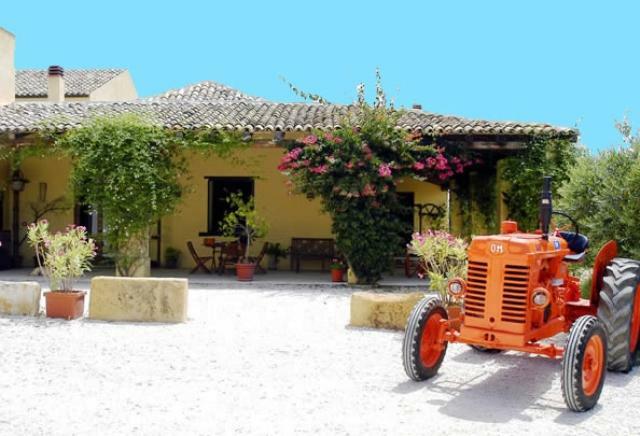 The food here is consistently excellent, you can sample some fine Sicilian traditional dishes with most of the ingredients coming from the farm, and all accompanied by the agriturismo’s very own wine. They have ten rooms in total, two quadruples, one triple, six doubles and one single, in the main farmhouse building and six self catering apartments in the nearby renovated storehouse to sleep up to four people each. They all have a rustic vibe with soothing pastel coloured walls and and some nice antique furniture, but they also have air-con, satellite TV, private bathrooms and WiFi for example, and you’ll generally find the accommodation super comfortable, and clean. The 50 seat restaurant, as mentioned above, has some terrific traditional Sicilian food & wine on offer and they are happy to cater for guests with dietary restrictions. Outside in the grounds there is a swimming pool and the whole property is surrounded by olive groves, grape vines and a beautifully peaceful, nearly 30 acre, stretch of old woodland that is lovely to wander around. You are also welcome to join in some of the activities around the farm such as, in season, harvesting the olives or grapes, and you can also try your hand at the ancient lawn bowling sport of bocce, play ping pong, go horse riding or take one of the farm’s bikes to explore the surrounding area. Tucked away near the coast of north west Sicily, the journey from Palermo should take less than an hour and a half, from Trapani less than an hour and from Marsala, less again. Rural Sicily has a wealth of ancient ruins and the area surrounding the agriturismo is no different. The ruins of the ancient Greek city of Selinunte, are just 10 km away on the coast with Segesta too being just 40km away. Both are very much worth a visit. You’ll find some nice beaches around this area too, and much lovely expanses of open countryside with small, sleepy little villages dotted in between. Having a car is pretty much required to fully explore the area though you can also hire bicycles from the farm for free.